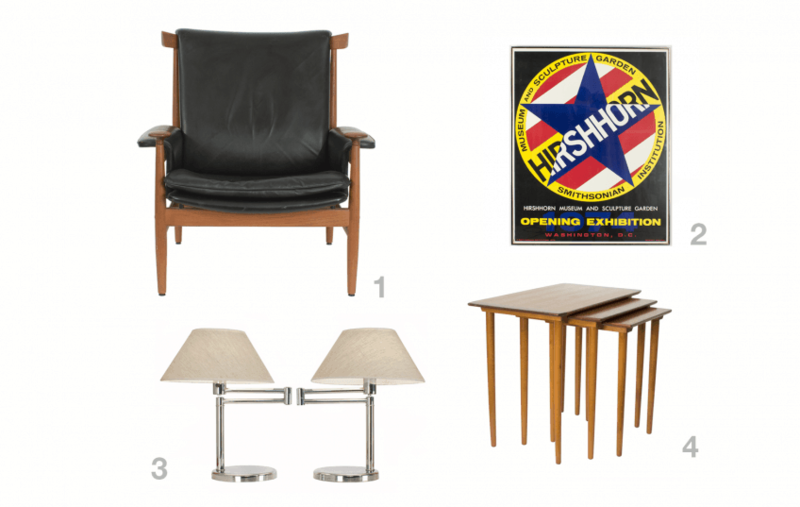 I imagine these vintage Midmod pieces in a sophisticated man cave or library. The mixture of black leather, rich wood, and chrome, with a pop of color on the wall makes for a cozy but modern look. 1. Bwana Chair by Finn Juhl for France and Sons was designed in 1962. It was intended as an update of the “Chieftain” chair. This lounge chair is a very early production with stamps on frame it is all it’s original glory with black leather upholstery and a very nice patina. 2. Poster by artist Robert Indiana is not strictly mid century modern, as it was done in 1974, but when I saw it with its graphic primary colors and bold composition it was a must have. It was designed for the Hirshhorn Museum and Sculpture Garden Smithsonian Institution. 4. Nesting tables are marked “made in Norway.” Their clean lines and minimalist formal aesthetic make them particularly elegant and especially suitable for entertaining.